Seventeen University of New Brunswick students have joined 138 students before them and were inducted into the Sir Howard Douglas Society of Scholars. The award recipients volunteer their time and talent in a number of ways, both locally and internationally, and are all dean’s list students. Nominated by their faculties, the scholars must have completed two years of their bachelor’s degree program, achieved academic excellence and actively participated in co-curricular or extracurricular activities. A dinner was held in their honour on Thursday, March 14, where the 2013 scholars were addressed by UNB alumni and former Sir Howard Douglas Scholars, Jon O’Kane and Ryan Brideau. Members of the Sir Howard Douglas Society, which was formed in 2006, have the opportunity to participate in special university events and become part of a network of outstanding students. 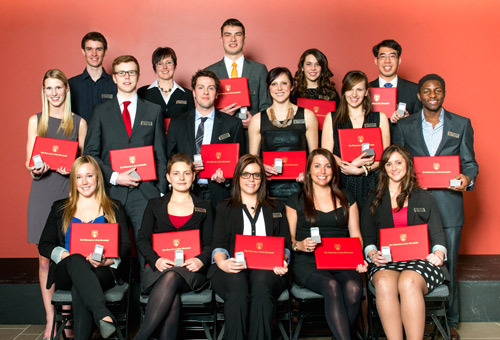 As the honour society grows each year, new members have the opportunity to meet and interact with past recipients of the Sir Howard Douglas Award. Born in Scotland, Sir Howard Douglas served as lieutenant-governor of New Brunswick from 1823 to 1831. During his term, he encouraged development, sought support for native peoples, improved communications and promoted education. Sir Howard was a founder and the first chancellor of King’s College Fredericton, predecessor to UNB. Carly Baxter, Saint John, N.B., Bachelor of Science (Major in Biology and Psychology), UNB Saint John, believes in the power of knowledge to transform lives and change situations. She is vice-president of the UNB Saint John chapter of the Golden Key International Honours Society, which promotes academics, leadership and service among its members. She is also a mentor with Big Brothers Big Sisters of Saint John. John Connell, Middleton, N.S., Bachelor of Philosophy in Leadership Studies, UNB Fredericton, is passionate about the outdoors and wants to find environmentally sustainable solutions to world issues. He is a volunteer with Parks New Brunswick Get Outside! N.B. program and is a student ambassador with UNB’s Pond- Deshpande Centre for Innovation and Entrepreneurship. Gillian Edwards, North Vancouver, B.C., Bachelor of Nursing (Advanced Standing Program), UNB Fredericton, has maintained high academic standing while balancing extra-curricular volunteer activities, a part-time job, and training for a half marathon. She volunteers with the Fredericton Therapeutic Riding Association and Girl Guides of Canada and is a certified doula. Melissa Foster, Moncton, N.B., Bachelor of Science in Kinesiology, UNB Fredericton, uses her love of sports and physical activity to encourage healthy lifestyles and positive self-esteem among youth. She is a member of the women’s basketball team, is co-founder and co-president of Right to Play UNB, and is a volunteer head coach of a Grade 5/6 girl’s basketball team. Jocelyn Fotso Soh, Garoua, Cameroon, Bachelor of Science (Honours in Psychology), UNB Fredericton, wants to pursue a career in medicine. He volunteers in the Chalmer’s Regional Hospital day surgery unit, helping nurses and patients; and is a mentor with UNB’s Successful Transition to Employment Program where he helps students improve their employability skills. Jessica Hanna, Fredericton, N.B., Juris Doctor, UNB Fredericton, believes in a socially just society that understands and values human rights. This commitment has led her to take on a number of roles including program coordinator for the UNB Chapter of Pro Bono Students Canada, blogger with the Canadian Civil Liberties Association and volunteer with the Poverty Law Society. Sarah Lyons, Matapédia, Q.C., Bachelor of Arts (Major in History), UNB Fredericton, is dedicated to global outreach and helping others. She taught at a school in a small village in Uganda that catered to orphaned children and volunteered at an organic farm in Kenya. Locally, she has volunteered to take children with disabilities curling and volunteered at the Harvest Jazz and Blues Festival. Joseph O’Kane, Saint John, N.B., Bachelor of Business Administration (Honours in Marketing), UNB Fredericton, wants to enhance the community and student life at UNB, both now and in the future. He’s been a member of UNB Fredericton’s Student Union, acting as both orientation chair and vice-president external, and is a member of UNB’s Board of Governors. He is also past-president of the New Brunswick Student Alliance. Jennifer Petryshen, Fredericton, N.B., Juris Doctor, UNB Fredericton, strives to maintain a balanced life and to contribute to her community. She is vice-president of the Fredericton Legal Advice Clinic and has worked with the New Brunswick Legal Aid Services Commission to review New Brunswick’s Legal Aid Act. Outside of school, she lends her knitting skills to making toys for cats in shelters. Ashley Savinov, St. John’s, N.L., Juris Doctor, UNB Fredericton, wants to contribute to the social fabric at the law school and make new students feel welcome. She has been a member of the Articling and Placement Committee, a group that assists students find a career in the legal field; is co-chair of Women and Law Society, and is a volunteer with Pro Bono Canada. Lauren Somers, Bedford, N.S., Bachelor of Science in Civil Engineering, UNB Fredericton, is passionate about creating a more equitable world. Last year, she spent four months in Malawi, southern Africa, on a volunteer work term with Engineers Without Borders Canada where she lived with a Malawian family and worked in partnership with the local government to increase water coverage in rural areas. Michael Stewart, Truro, N.S., Bachelor of Science in Software Engineering, UNB Fredericton, wants to empower youth to create a world where people are self-fulfilled and play a constructive role in society. He is president of the UNB Rover Crew, which provides mentoring and leadership development opportunities to youth, and is the deputy commissioner (communications) for the New Brunswick Council of Scouts Canada. Jonah Tremblay, Hanwell, N.B., Bachelor of Science in Electrical Engineering, UNB Fredericton, is saving lives and helping people get a new start in life. He is a volunteer firefighter and in 2011, he worked with Habitat for Humanity to build a home for a local family. On campus, he is the president of the Electrical, Computer and Software Engineering Society and has been a tutor to first-year students. Meaghan Waugh, Douglas, N.B., Bachelor of Nursing, Bathurst Campus, UNB Fredericton, making a difference at home and abroad. She spent three months in Guyana, South America, working on health promotion projects such as HIV/AIDS awareness, leadership, literacy, and life skills training. Her experience in Guyana led her to continue her advocacy in sexual education in her own community. In 2011, she was the AIDS Walk for Life coordinator for northern New Brunswick. Jakob Wildman-Sisk, Barrie, O.N., Bachelor of Philosophy in Leadership Studies, UNB Fredericton, wants to empower youth. He worked with the United Way to implement a pilot project that encouraged rural New Brunswick high school students to become leaders and make lasting change in their communities. He also travelled to Bhutan, where he helped to develop a leadership workshop for local high school students. Jackson Wo, Fredericton, N.B., Bachelor of Science in Chemical Engineering, UNB Fredericton, wants to share his love of classical music with the university and the world. He is the founder of the UNB String Orchestra, which is in its third year, and is a member of the New Brunswick Youth Orchestra. He has performed internationally and for royalty. Outside of academics and music, he has lent his time to volunteering at the Chalmer’s Hospital.